Konstantin Tonkov has been working in the software testing sphere for 7 years and is now at ISS Art. In addition to coding, Konstnatin likes playing board and video games. JSR223 (Java Specification Request 223) is a framework for embedding your scripts into Apache JMeter™’s Java source code. Since JSR223 components can be used to enhance your control over your Test Plan, they are one of the most useful tools for performance testing with JMeter. There is a whole family of JMeter JSR223 components: a sampler, an assertion, pre- and post- processors, a listener and a timer. While you can use a range of languages in JSR223 components, scripts written in the Groovy language can be significantly more efficient than BeanShell components or other languages. In this post I will look at the top 8 JMeter Java classes that can be used with Groovy in JSR223 components, for customizing your scripts to suit any task. In object-oriented programming, classes are templates for creating objects, by describing the fields and methods of corresponding objects. JMeter is written in Java Language, so all the JMeter entities - like sampler, cache, listener, result - are described in the associated Java Class. Therefore, you can use these classes In your JSR223 component to modify an entity behaviour as you wish. To invoke a class method you need the class object. Fortunately, most of the useful objects, like the current sampler or current result, already have a variable for them defined in the JSR223 components. For example, to access a Logger class object, you can simply write "log" and then invoke class methods. Same for the "sampler" variable, that points to the current sampler object of the HTTPSamplerProxy class. You can find descriptions and examples of some useful classes in posts like “How to Use BeanShell” and “BeanShell for Beginners”. In my post I will try to look deeper into some classes mentioned in the posts above, as well as some other classes that I find worth mentioning. These classes were chosen because they allow you to easily write performance scripts for tasks of high complexity, invoking the full customization potential of JMeter. Logger is actually not a JMeter class, rather it is from a third-party library. You can access a Logger object for your component by using the log variable. The Logger class is very important for scripting because it lets you debug your scripts more easily. By letting you output any information to the JMeter log, you can check precisely if there are any issues with your scripts and where they occur. You can set the desirable level in Options-> Log Level to Debug. When a log level is set, all messages of that and upper level are displayed. 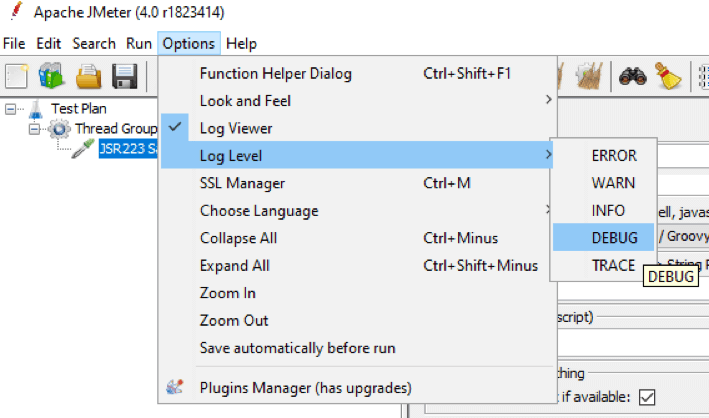 For example, if you set your log level to DEBUG, then all messages of levels DEBUG, INFO, WARN and ERROR will be displayed in the JMeter log. By default, the log level is set to INFO. Here are some examples of how you can use different methods of the Logger class to output custom messages on different log levels. Use the debug(String message) method to write debug messages to the JMeter’s log. The code above will output the current thread number in the JMeter log. The SamplerResult class represents a sampler execution result as it is passed to listeners. This result contains data from the sampler’s execution, like response time and response data. In your JSR223 script you can access a SamplerResult object for a current sampler by the pointer prev. You can find usage examples here and here. The HTTPSamplerProxy class is a proxy class for controlling HTTP Samplers. This is an extremely useful class for accessing and setting data for your HTTP Samplers. A pointer to a current sampler is already set in a JSR223 component - its sampler. Using this pointer, you can establish full control over the current sampler through your script. You can change the HTTP method, arguments, headers, cookies and many, many more by invoking methods of an HTTPSamplerProxy object. All the available methods are listed on the JMeter API documentation site under HTTPSamplerBase class documentation. The HTTPSamplerProxy class offers you a great amount of control over your JMeter script. Sure, you can use your JSR223 script to set JMeter variables and then pass them to the sampler’s fields, such as a host, path, or even Header Manager’s headers in the JMeter GUI.. But some parameters like, for example: “Follow Redirects”, “Use KeepAlive”, or “Retrieve All Embedded Resources” can’t be controlled via variables. Nor can you set a variable quantity of arguments to pass. These need to be set directly in the JSR223 script, with the HTTPSamplerProxy. You can pass any string value as a request body. Some protocols, like OCSP and NTRIP, are communicated over HTTP, so you can encapsulate, for example, an OCSP request to the body data of your sampler to test other protocols. adds a new header “Accept: application/json” to a current sampler. It's literally impossible to describe all the use-cases of these “control” classes and all their methods. Therefore, I strongly recommend personal investigation, experimenting and consulting with colleagues to learn the best ways to use them. JMeter Java classes are written so that it is easy to access their methods through your scripts. With a little effort you can perform a fine tuning of your Test Plan to solve most sophisticated tasks. If you have any troubles, you can consult the exhaustive API documentation. When you’ve completed creating your script, run your JMX file in BlazeMeter. You will be able to share tests results, get advanced analytics and scale to multiple geo-locations. Start testing now by putting your URL in the box below. Beanshell vs JSR223 vs Java JMeter Scripting: The Performance-Off You've Been Waiting For! Using Beanshell for Beginners - No Java Knowledge Required!